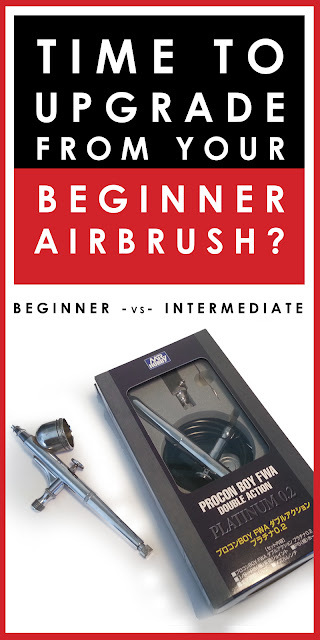 Dave's Model Workshop: New video: Is it time to upgrade your beginner airbrush? Cheap v intermediate examined. New video: Is it time to upgrade your beginner airbrush? Cheap v intermediate examined. I've been using the same cheap airbrush for the last ten years. The generic Sparmax DH-103 airbrush and compressor cost me $100 Australian back in 2007, and it has never given me a moment's trouble in all that time. Everything you've seen me produce has been painted with that rig. But I recently decided that it was time for me to upgrade, to lift my game and get a better airbrush. Don't get me wrong - you can get by for a long time with a cheap beginner airbrush (hell, I did). If you're considering your first foray into airbrushing scale models, I would most definitely recommend you pick up a cheap one to learn on. I promise you, once you try airbrushing you will never go back to only using paintbrushes - I guarantee it. But there are compromises involved in a cheap airbrush, and eventually you will want to get a better brush. It took me ten years, your results may vary (or you might be less of a tightwad than I am!). So I got a new, higher-spec airbrush from SprayGunner.com - it's a 0.2mm Mr Hobby Procon Boy FWA Double Action Platinum. It is a bit of an eye opener to me. I can't put it any other way - it is just a lot better than my current cheap airbrush. If you're interested in picking up one for yourself, here is a link (I get no commission, BTW!) - and even better, if you are a member of The MOD Squad you get a 10% discount. Win / win! The full details are in the video below, but the main difference is the control of how precise you spray. For fine work, like say freehand airbrushing 1/72 scale camouflage, it makes a huge difference. Watch the video, you'll see what I mean. Now I need to think about if I ever want to pull the trigger and buy one of the really expensive airbrushes, like a Badger or Paasche. Those are in the US$200+ range, and I've been told that the results you see in a jump to an expert airbrush is the same as the jump from a beginner's to an intermediate. I'm not ready for that expense yet, but it would be interesting to see. Maybe a future video, who knows? Is it time to upgrade your beginner airbrush?